Blog post by Modern Maker participant, Bryony Rose. Day 1: Today was the first day of Modern Makers 2017 at Hannah McAndrew and Doug Fitch’s pottery studio just outside Castle Douglas. They specialise in earthenware slipware pottery and use a wood kiln to fire their work. 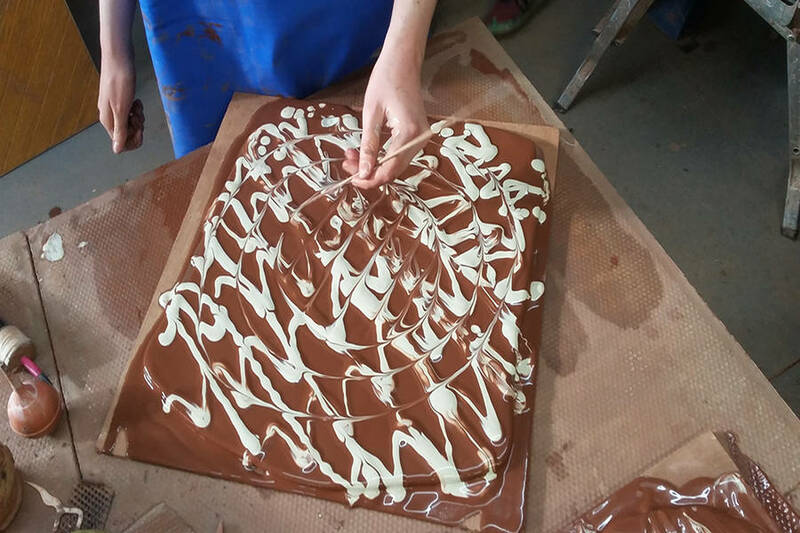 We made several press mould dishes each– using a slab roller to create a flat square of clay that can be pressed onto a mould and left for a few hours to dry out a little before taking them off the mould to dry out further. They will be decorated on the next day, once leather hard. We also tried different slip trailers and saw the different marks each can make – from loose, runny slip, which can be almost poured onto a surface, to thicker slip which can make more precise decoration. Finally, we covered a slab rolled flat square of clay in black slip to make a wet surface and drew on this with a running white slip – using a sort of pouring slip trailer. The slip moves alarming fast from the trailer and we saw how this can be a quick way of drawing on clay. The fluidity of the mark you can make this way can be very beautiful. The flat decorated surfaces of clay have to be left for a few days to dry a little before they are pressed onto a mould.